Durga Puja is just round the corner and New Jersey Bengali Clubs are gearing themselves up for the great event. The clubs are trying to attract the Bengalis of New Jersey with a wide range of star studded cultural programmes along with domestic shows, not to mention the sumptuous dinner to be served each evening. On line registrations have started and soon they will all be sold out. So act fast to ensure your attendance. Here is a sneak peek into what to expect at the major Pujos of New Jersey. Kallol of New Jersey will be celebrating their Pujo from Friday October19th to Sunday October 21st at the Urkranian Cultural and Community Center, 135 Davidson Ave., Somerset, NJ. On Friday evening, the Kallol Pujo auditorium will dance to the melodies of Arnab Charkrabarty, a talented young playback artist who, in 2008, received the championship award for Sony Entertainment TVs K for Kishore contest from the legendary singer Asha Bhonsle. He has also sung for many popular Bollywood movies and television ad jingles. On Saturday, the well known playback singer Sadhna Sargam will take the stage along with Srijoy. Sadhana Sargam is one of the few singers equally recognized and successful in both classical and light music fields. She has won several awards throughout her career including the Indian national award for best female playback singer in 2002 for a Tamil song “Pattu Solli” from the movie Azhagi, composed by Ilayaraja. On Saturday, we’ll also have the good fortune of listening to Rajyashree Ghosh, a classical vocalist of excellent calibre. She has the special distinction of being equally adept at both Raga Music (Kheyal) as well as the lighter semi-classical genres such as Thumri, Dadra, Bhajan, Nazrulgeeti, Bengali Tappa and Puratani Songs.Following its age old tradition, Kallol will also stage a Bengali drama on Saturday evening, a hilarious play titled “Tulkalam” written By Debaki Bandopadhay. The play ( a stage version of the popular Hindi film Golmaal featuring Utpal Dutt and Amol Palekar) is directed by the veteran actor/director Arunansu Dasgupta and will feature many familiar and new faces of our community. Sunday evening will feature the famous Sarod maestro of our generation, Pandit Tejendra Narayan Majumdar – a worthy disciple of Ustad Ali Akbar Khan. He will be accompanied on Tabla by another very talented musician, Subhankar Banerjee. The grand finale on the 2012 Durga Puja celebrations will with an electrifying concert by the undisputed Disco King of India, Bappi Lahiri. 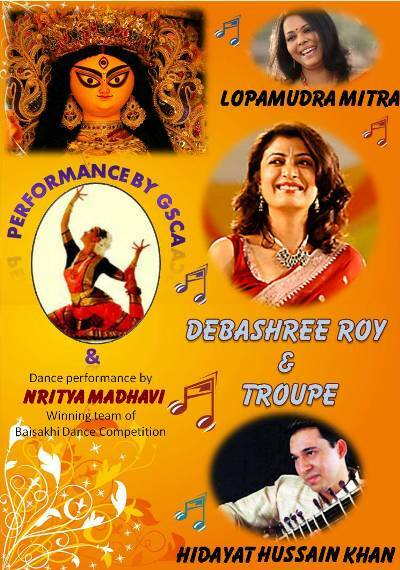 The other major club, Garden State Cultural Association (GSCA) will be celebrating their Pujo on Saturday October 20th and Sunday October 21st at the Plainfield High School. GSCA, like previous years, have arranged for us an impressive lineup of artists. On Saturday evening, Hidayat Hussain Khan, son of the legendary Sitar maestro Ustad Bilayet Khan, will be presenting a fusion performance. This will be followed by a vocal performance by Lopamudra Mitra. On Sunday, well known actress (and Member of West Bengal Legislative Assembly) Debashree Roy and her troupe will be staging a Jatra Pala. Although I am presuming that this will be staged on the proscenium theater of Plainfield High School Auditorium, but nonetheless it will be an spectacle that the audience will sure remember for a long time. GSCA will also present few local programs presented by talented local performers. This year we have a new organization Utsov celebrating Durga Puja in New Jersey for the first time. Utsov will hold their celebrations at the Piscataway High School on October 20th and 21st. The key feature of this Pujo is that they have no admission fees, although voluntary donations are welcome. Unlike the other major community Pujos, the attendees of Utsov Durga Pujo will have to purchase their food (snacks and dinner) at the premises served by a local caterer. The entertainment program, to be held on Saturday evening, will include Saswata Sanyal with his innovative renderings of Tagore songs, Aakash Deep with his modern Bengali songs, creative dance presentation from Nritya Creation Academy of Dance, plus many more local talents. We welcome the new Pujo and hope that it will add more color to our Pujo celebrations in New Jersey. Anandamandir will be starting their festivities with their traditional Mahishashura Mardini or Mahalaya program, live at 5:00am on October 14th. On 22nd October, the day of Mahashtami, Anandamandir will feature classical and semi-classical vocal music by Sanjukta Biswas. 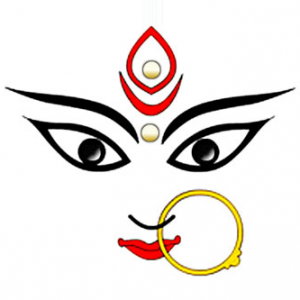 ICC GS (Indian Community Center of Garden State) will be celebrating their Durga Puja on October 27 and 28th at the Mt. Olive Middle School, 160 Wolfe Road, Budd Lake, NJ 07828. The entertainment program will include Tagore’s dance drama Shyama and playback singers and performers from Mumbai and Kolkata. I am yet to get information about the other Bengali clubs and organizations and their Pujos. As soon as I get them, I’ll update the post with their cultural program information. Wish you all a Happy Durga Puja. As always, when you see fall color in leaves, you know that Maa Durga is here, only that the beautiful fall colors substituting the traditional Sheuli flowers. Bharat Sevashram Sangha, New Jersey chapter, will be celebrating Durga Puja in the most traditional way you can expect and remember about your younger days! Everybody along with family and friends are welcome to enjoy this Ghoroya puja. In Pitripokha, live Mahalaya will be staged by a big group of local artists , eminent musicians from the Garden state as well as Mumbai. To top it all, there would be dance accompaniments to this wonderful program we are all looking forward to. Time: 4.30 am, Venue: 3490 Route 27 (use Lincoln Hwy for your GPS) Date: October 13, Saturday. Please find the details in the website http://www.bssnj.org. Mahayana Durga Puja is celebrated in Bharat Sevashram Sangha starting with Matri Bodhan on MahaShasthi evening, October 20. MahaShaptami, Mahayana Ashtami, Mahayana Nabami and Bijoya Dashami will be celebrated on October 21,22,23 and 24 respectively. Everyday the puja starts at 8:00am and continues until evening , with a short break in the afternoon.Pushpanjali pradan and Mahaprasad distribution at lunch and dinner. As the inauguration of the new temple building was completed early in the year, a larger number of crowd is expected this year. AS MOST OF KNOW, ONLY VOLUNTARY DONATIONS ARE expected from all Bhaktabrindo.Please check out the details of Puja timings, Arati and Pushpanjali at the website mentioned above. Many people , even from outside the state come down every year to relish a taste of Barir Puja .Don’t miss it when you are around. If anybody wishes to sponsor any Puja, please contact the temple at 7324228880. We are eagerly looking forward to be a part of the celebrations next year. Unfortunately there is nothing in Mexico City. We wish all the clubs and associations the very best this year. College r chuti pore jabar por pujor gota package ta just fatafati.